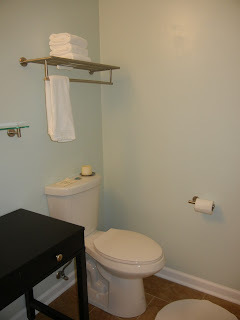 It's Not Rocket Science: OMG bathroom update! It's only taken 3 months! So, here are lots of pictures to make up for it. We like our OXO tension rod holder; it's super easy to clean, and is very sturdy. No rust after 3 months! Well worth the investment, especially because we can take it with us when we move. 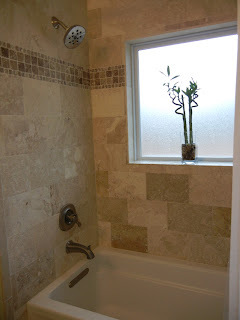 I love the shower with trim tab. The water is always at the perfect temperature. The travertine is easy to clean; just sponge down with hot water. The tub is acrylic so we clean that with Scrubbing Bubbles but we're careful to keep it off of the tile. We love our dual-flush toilet. 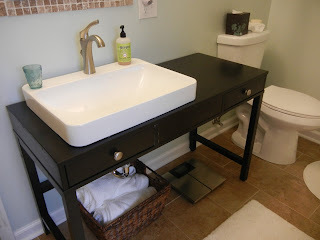 It was the $98 option at Home Depot, and even though it's not Kohler (it's Glacier Bay), it has clean smooth lines and is easy to sit on (a huge improvement over the tiny, low, 70's toilet in the other bathroom). TMI? Sorry. I loooooove my hair dryer holder. This is my space for clutter. I have a little earring tree, a jewelry box, and my makeup organizer. I have my own little light, and it's dark in this picture but that's my cell phone camera's fault. I have plenty of light to do my own thing without crowding the sink. It's like we have the buyer-desired two sinks, but minus the one sink. That didn't make sense... We have two spaces to get ready even though we only have one sink. 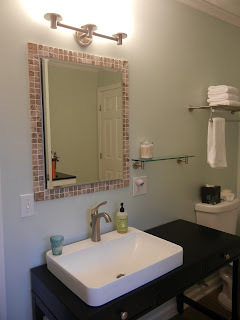 I also like the tile around the medicine cabinet. 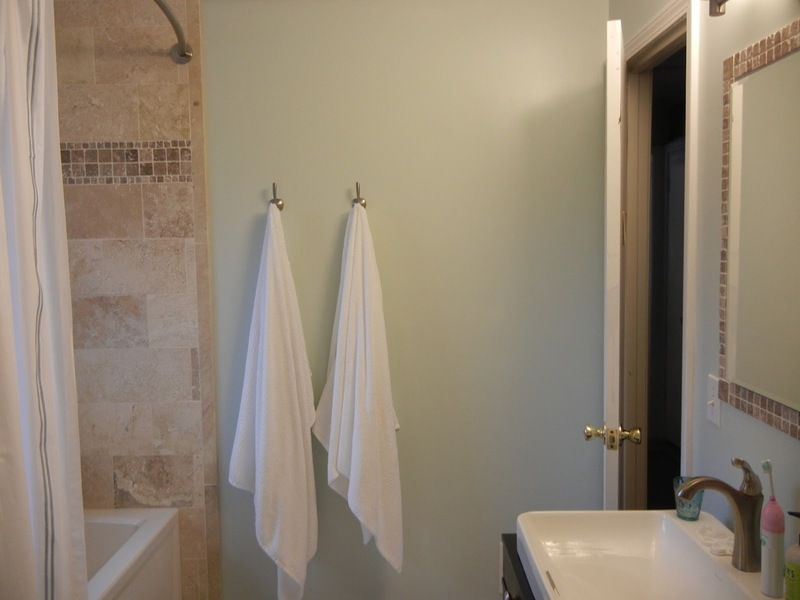 It matches the tile in the shower, and makes the whole thing feel less medicine-cabinet-y. It's not perfect, but only I will notice the imperfections. One blog I read puts it: it's not perfect, but if you do notice then good for you! You get a cookie! You are very, VERY observant. 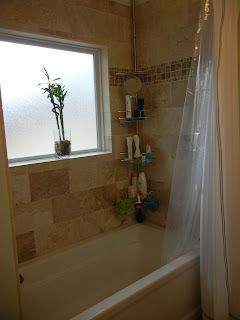 The shower is in the same location; the tub, window, and fixtures have been replaced and we've obviously retiled. 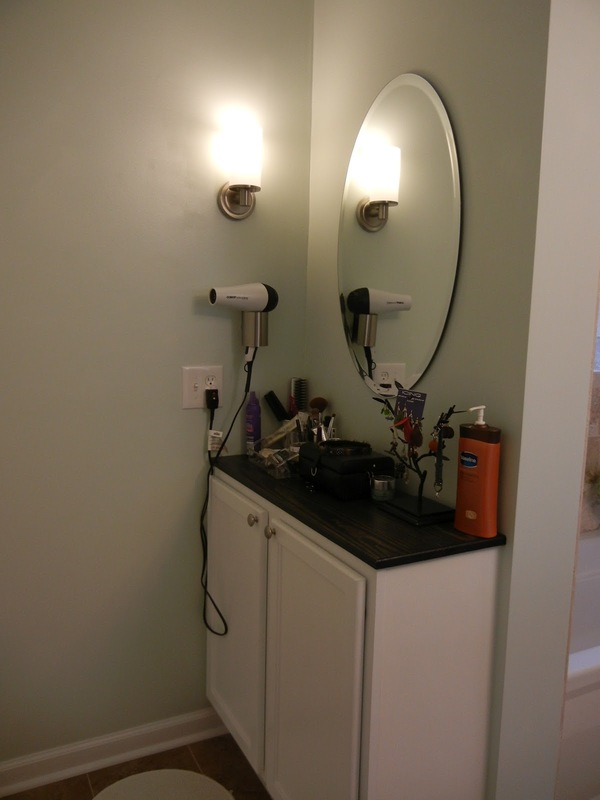 Note the mirror resting directly on the vanity. The mirror is currently in the garage; the front frame has been spray-painted an avocado green, the sides are going to be painted gold, and then it will hang in our living room. 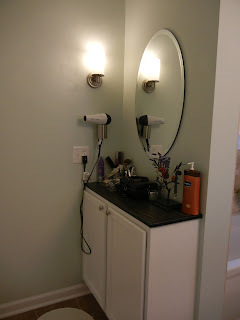 The big sink vanity has been replaced by my little cabinet/make-up station. This corner now has the toilet. Glamorous. Anyway, technically we are not done with the bathroom yet because we still need to paint a teensy bit of crown molding on the tub/towel hook wall. We will also replace the door to the hallway with a 6-paneled door. In the interest of full disclosure, we did have a few floor tiles come loose as well. We suspect it's because the leveling system we used has little plastic clips that exert an upward force on the bottom of the tiles, and so if there was any weakness in the thin-set the tiles would come loose. We will evaluate them over the next few months and possibly repair them. Right now they're hidden under the bath rug though, and so we're hoping the plastic clips lose some of their springy-ness and then we'll re-mortar them.